The Whispering Pines Golf Course is nestled in the heart of the Grand Strand and conveniently located just half a mile from fantastic attractions and affordable accommodations that include Myrtle Beach condos, Myrtle Beach resorts, and Myrtle Beach vacation rentals. Architects Dye, Finger, and Spahn created the course layout to enhance the breathtaking surroundings accented by giant pines and mature hardwoods. Boasting over 6,770 yards, Whispering Pines offers plenty of challenges and enjoyable golf. At Whispering Pines, golfers are kept on their toes with strategically placed sand bunkers, water hazards, tree lined fairways, and finger lakes. Beautiful TifEagle Bermuda greens set the playing field. The course has an above average slope and accommodates all handicap ratings. 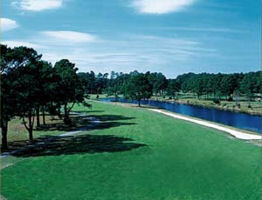 Both experienced and beginner golfers agree that this is a must play Myrtle Beach golf course. As a no backyard - distraction free golf course, there are no excuses for not making the perfect shot. On your next golf vacation, play Whispering Pines and cash-in on your extraordinary golf discount. The centralized location and welcoming staff make golfers return year after year. When it’s time to relax, the clubhouse is the perfect retreat. Need fine-tuning or course tips? Golf lessons are available at Whispering Pines Golf Academy. Whispering Pines is a non-metal spike course and offers a spike changing service. Every golf vacation should include a round at this Myrtle Beach golf course. Myrtle Beach golf deals are available when booking tee times early. Golf Myrtle Beach and include Whispering Pines Golf Club when reserving future Myrtle Beach golf packages! Book your Myrtle Beach tee time now at Whispering Pines, No Gimmicks…Just Satisfying Golf! Don’t come here unless you’re a local that knows the course and can keep up. We played here before a wedding expecting a relaxing day. Without giving us any warning, a man came up on a cart and forced us to essentially skip a hole because the locals behind our group started too early (were basically shooting par) and were complaining that we weren’t keeping up with their pace. Keep in mind, our group paid over $700 to golf that day. I have never had this happen at any other course in any state. If you’re visiting, I suggest looking for another course for a fun time. Great place to go hit the par. Quiet, and great little course. I golf in a league at Whispering Pines. The course is in great shape and the staff is very nice. Worth the trip. Great greens. Fine course and cost. A fun afternoon. Very playable! Great course. Played there in 2014 and the guy who checked me in complemented me on my UofL golf shirt. Being from Ky we had a laugh as he told me that we needed to beat Clemson as he was a GameCocks fan. Nice staff and having family that served in the Air Force it was cool knowing that the course was built on an old Air Force base. Nice course with friendly staff. Course in great shape. Will play it again. Had a great time. Employees were outstanding. Friendly staff , very good shape from what is was several years ago. I agree that the beer prices are eay over board, if the made it more reasonable many of us would remain after a round rather than getting together elsewhere. Course was in good shape but the greens had just been punched. Great day overall. Course was busy but not crowded. Excellent range, decent bunker practice area, putting practice area good. Course greatly improved over last couple years. Ocean breeze helps on hot days. I only spent time here because of the convenience of the location. Not in very good shape for a "Myrtle Beach" golf course. Also, the staff could stand to be a little more welcoming to visitors. I walk into the pro shop. Gene is friendly with the local in front of him. Charges him $30 plus tax. I get to the counter. Straight faced without much enthusiasm he says,"forty dollars plus tax". They discriminate against travelling golfers! So much for southern hospitality. Architects Dye, Finger, and Spahn created the course layout to enhance the breathtaking surroundings accented by giant pines and mature hardwoods.